Description: The Minke whale or “Minkie” is the smallest baleen whale, but is still a very impressive animal, considering its size of about ten metres. It resembles other baleen whales in shape and colouration: slim and streamlined, dark- grey to black back with a pale belly. Next to the relatively small size, the dorsal fin is important for identification: It is large in relation to the body, at least in comparison to other whales. In shape, it resembles a sickle and is placed to the front of the last third of the body length. The blow is small and does not have any specific shape; the fluke (tail fin) remains invisible when it dives. It does not spend much time at the surface, unless feeding there. Distribution / Migration: Minke whales occur in all of the world’s oceans, predominantly in high latitudes. The population in the north Atlantic is thought to be about 100,000 animals, but estimates vary between official studies in countries that allow whaling (Iceland, Norway) and other scientists from many countries. 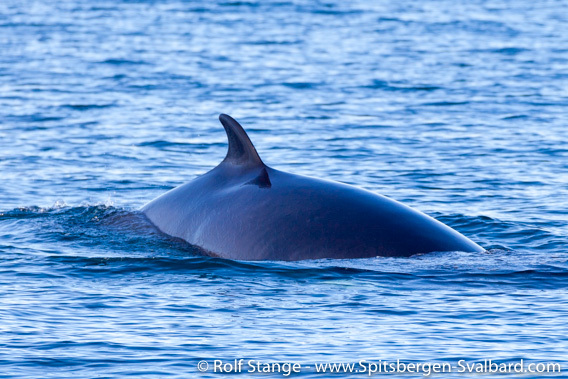 Minke whales are not very abundant in Spitsbergen, but show up regularly in fjords, coastal and offshore waters and near the ice edge. Sightings of single animals are most common, but small herds occur occasionally. During winter, they retreat to latitudes somewhere between Portugal and the Carribean. Biology: In the North Atlantic, Minke whales feed on a range of small fish species as well as plankton (in Antarctica, you would call it krill) which they filter with their baleen plates. They also take larger fish species, but only to a very subordinate degree; competition with commercial fishing is thus not significant. Mating is generally between October and March, depending on the region and population. After a pregnancy of ten months, a 2.5 metres long calf is born in the wintering area. 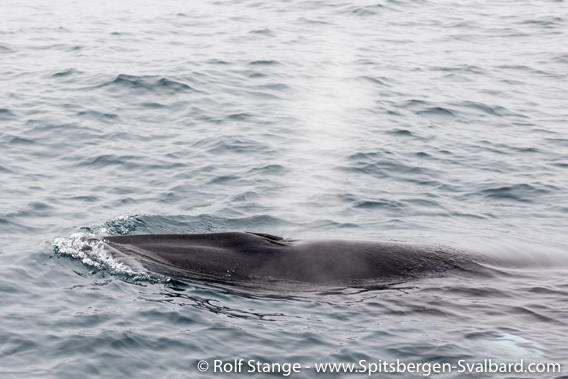 Minke whale in the open Barents Sea. Miscellaneous: Minke whales show up only for moments, dive again and then show up again at a different place and are thus difficult to observe and to photograph. Spectacular observations such as curious individuals approaching boats and displays of acrobatic behaviour are rare, but do happen. Minke whales have been hunted for many centuries in the North Atlantic. 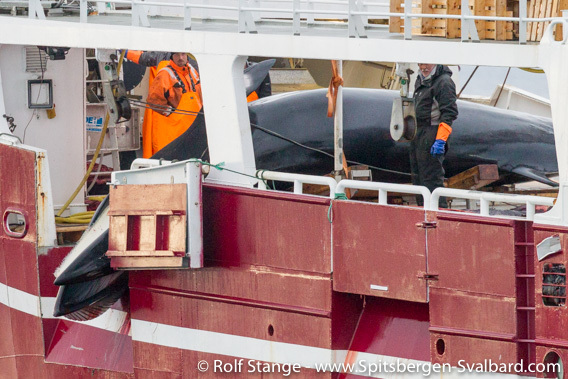 Norway still allows its small whaling fleet an annual quota of more than one thousand animals, although this is highly contentious even in Norway. 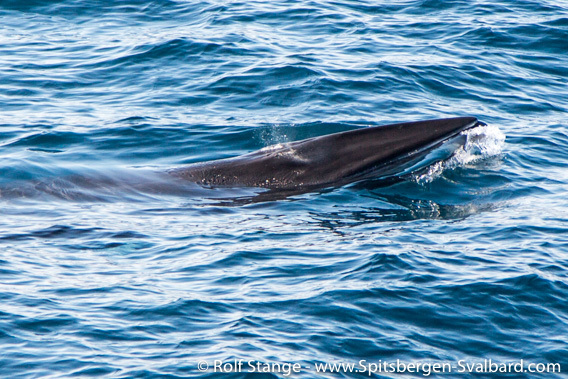 In 2014, there was a Norwegian quota of 1286 Minke whales, of which 595 were caught. Whaling: harpooned Minke whale. May 2015, Barents Sea.